All-star athlete or top-notch student? 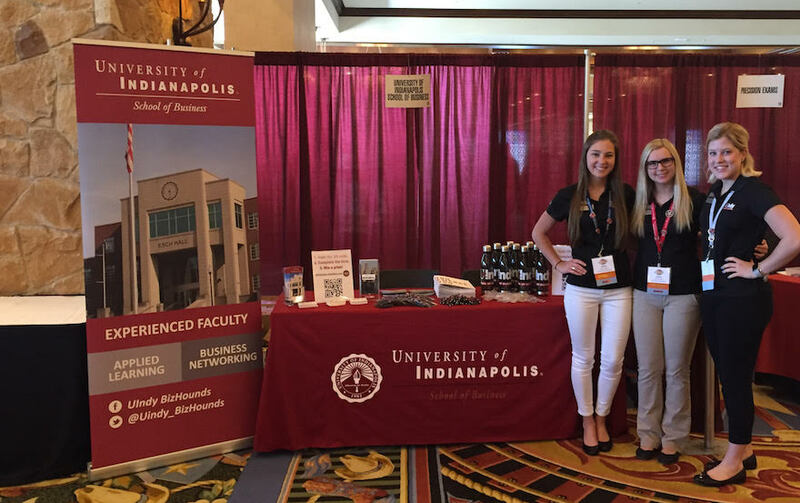 University of Indianapolis students and alumni are proving you don’t have to choose one over the other. University of Indianapolis student athletes – and their coaches – have long known that the multi-tasking, disciplined approach required for excellence in athletics and academics can prepare them for a variety of careers. 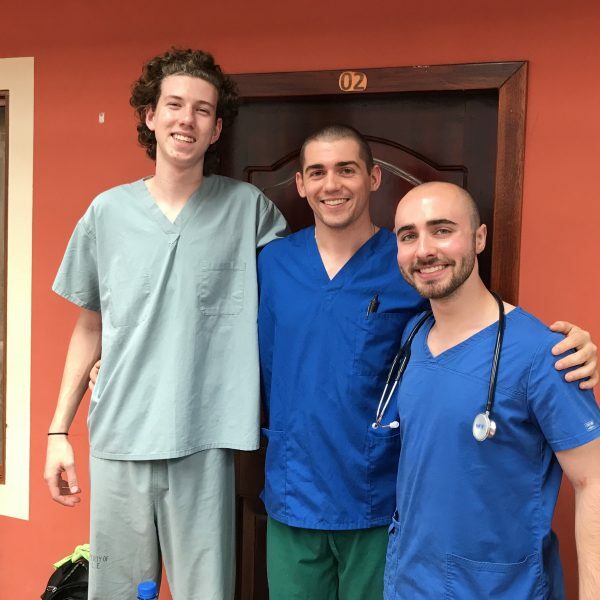 Three student-athlete alumni who are pursuing higher degrees in the medical field say their experiences provided them with a distinct advantage over their peers. 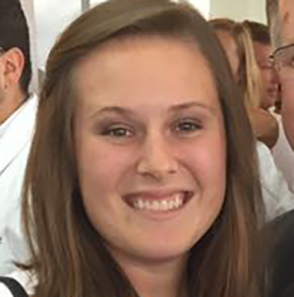 “Athletics really teaches discipline, dedication, teamwork and time management; all aspects that I believe will be essential for success in medical school and as a physician,” said Samantha Holmes ’17 (molecular/cellular biology with concentration in pre-medicine). Holmes was a varsity member of the cross country and track and field teams throughout her University of Indianapolis career and chose the Indiana University School of Medicine after being accepted into three medical schools. Holmes, who plans to specialize in dermatology, also credits her capstone project in preparing her for doctoral studies. 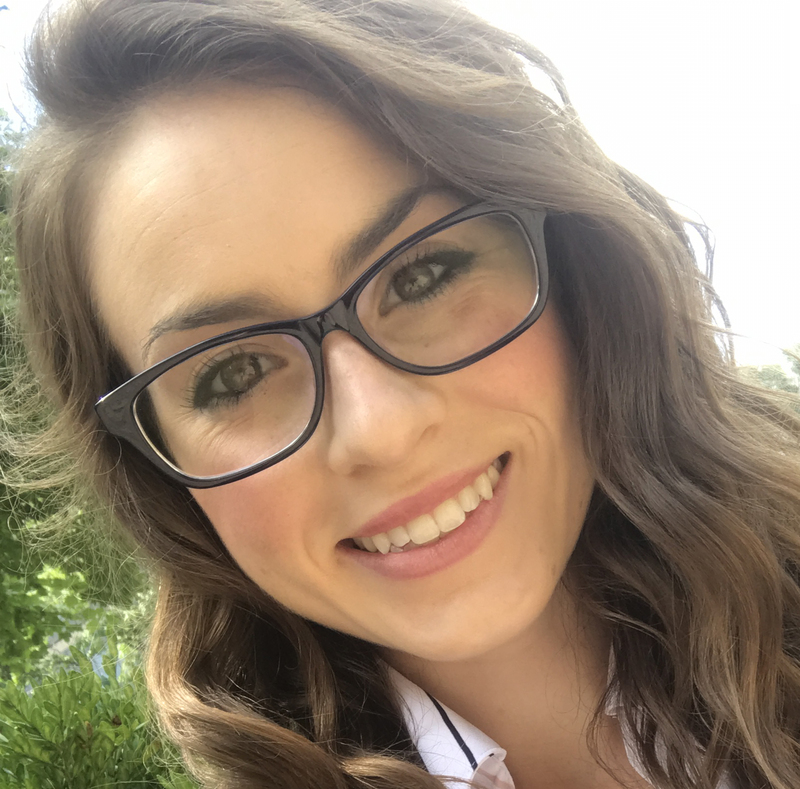 “I had many interviewers ask about my research, so I believe it definitely helped me stand out during the medical school interview process,” Holmes explained. Sue Willey, vice president for intercollegiate athletics, said the priorities of the University of Indianapolis athletics program are for every student athlete to graduate; to always represent in a positive manner; and to win. She pointed out that the goal is for every team to maintain at least a 3.0 GPA, with last year’s overall GPA among all teams at 3.2. University of Indianapolis athletics GPAs are among the strongest in the Great Lakes Valley Conference. 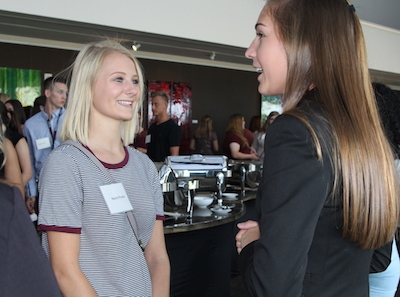 With about 700 student athletes enrolled for the 2018-19 academic year, Willey said they receive as many academic as athletic accolades – and that’s something that makes a candidate stand out when applying for medical school or for a job. “A lot of times businesses will come and want to recruit student athletes because of their abilities gleaned from being on a team. That’s what they want in their corporation. Businesses understand the value of an athletic experience because it does bring a lot of qualities to the table,” she said. 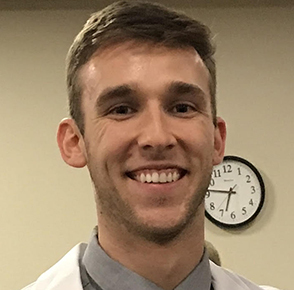 Luke Hubert ‘16 (biology major, chemistry minor) is entering his third year at Indiana University School of Optometry. A tennis standout, he garnered numerous accolades and titles during his time at UIndy, including Academic All-GLVC three times, ITA Scholar Athlete, Capitol One Academic All-America® Second Team and All-District First Team and a UIndy record-breaking 81 career victories. Hubert said his challenging tennis routine gave him a strong sense of time management. “It’s tough to balance that and school, and once you are able to balance it, it’s much easier to transition to a graduate level program where school is more demanding,” he explained. 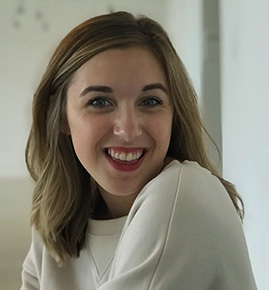 Molly Ward ’16 (biology) is a third-year student at Indiana University School of Dentistry, and will graduate in 2020 as a doctor of dental surgery. Ward, a three-time Academic All-GLVC honoree, was a member of the 2015 University of Indianapolis women’s golf national championship team. 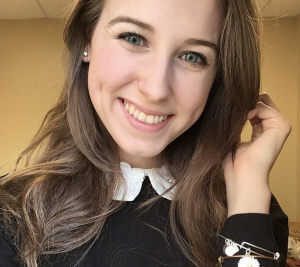 She credits the time management she learned as a member of the golf team, which required significant travel, and faculty who challenged her with rigorous coursework as good preparation for dental school. Mentors played an important role for each student athlete. Hubert credits Kathy Stickney, associate professor of chemistry, and President Rob Manuel for supporting his academic and professional goals. “Dr. Stickney is amazing – she helped me through the process of applying for optometry school. Dr. Manuel has also been a great resource for me. I’ve asked him questions about running my own business. He always has well thought-out answers,” Hubert said. “Dr. [Douglas] Stemke (associate professor of biology) helped me in so many ways throughout my entire career at UIndy. From being a great professor, letting me be his teaching assistant for lab, getting me in touch with a doctor to shadow, and even helping me with mock interviews, Dr. Stemke was so helpful and I can’t thank him enough,” Samantha Holmes said. Learn more about UIndy Athletics. Written by Sara Galer, University of Indianapolis senior communications specialist. Send your story ideas to newsdesk@uindy.edu. About 1,200 freshmen moved into residence halls (Warrens, Craven and Cory Bretz) Wednesday, Aug. 22 with help from volunteers including faculty, staff and upperclassmen. Hundreds of volunteers helped more than a THOUSAND New Hounds during their first official day on campus. The Class of 2022 represents 24 states and nearly two-dozen countries and boasts an average freshman GPA of 3.5 with a record number of students admitted with distinction. 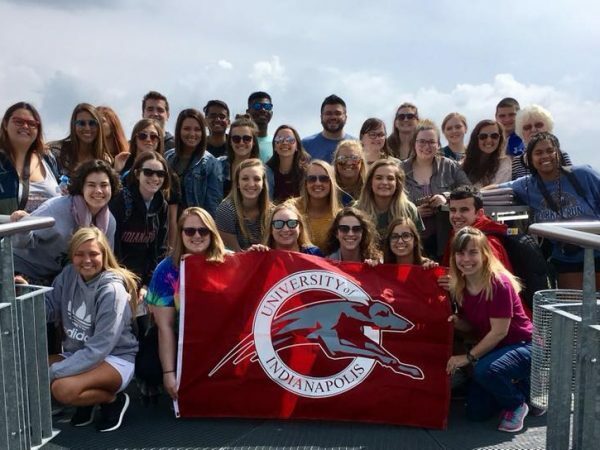 Nearly 6,000 undergraduate, graduate and doctoral students are enrolled at UIndy for the fall semester, including more than 200 international students from 30 countries. As enrollment grows, so has the need for faculty who are dedicated to creating experiential learning opportunities for students both inside and outside the classroom. This fall, the University welcomes 44 new faculty members. Two students from the University of Indianapolis recently earned Gold Badges in coding through a partnership between the Independent Colleges of Indiana and Fishers-based Eleven Fifty Academy. Cheri Walker-Owens ’18 (criminal justice major with concentration in cyber security, theater minor) and Alexis Meier ‘20 (business administration and management) participated in Smart Launch Tech, a coding program designed for liberal arts students. They joined students from 14 private colleges around the state who completed the month-long program in June, each earning the industry- and state-recognized Gold Badge Certification from Eleven Fifty. Walker-Owens said the course was a good fit with her interest in cyber security. “It is beneficial to know as much as I can about how computers and networks function, so I can be better prepared to figure out how people might try to exploit them,” explained Walker-Owens, who participated in the Ron & Laura Strain Honors College during her undergraduate career and presented research on Scholars Day in April 2018. Meier, who works at the IT Help Desk on campus, was alerted to the program by her supervisor, Gail Cooper, director of the Help Desk. “I was intrigued by coding and all it entailed so I jumped on the opportunity,” Meier said. Walker-Owens, who also worked at the IT Help Desk as a student, graduated in May 2018 and is now interning as a junior security engineer with the Indiana Office of Technology. She plans to use her newfound skills on future projects – and if her employer requires those skills, she points out that she’ll already be qualified. “Coding is a very valuable skill for anyone regardless of what field they are in. All jobs are involved with technology in some way and knowing how to code just gives you even more qualifications. It can also be a starting point to get into the tech field,” she said. In addition to coding, students in the program learned about the wide range of career possibilities within the tech field, including project and marketing management, data analysis, compliance, security and design. 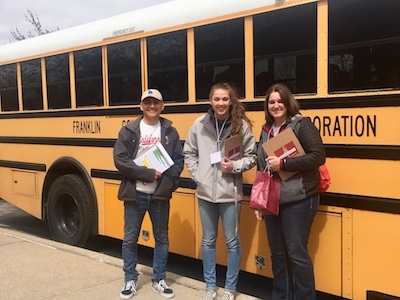 Students visited Indianapolis tech businesses including High Alpha, Pattern89, Kinney Group and One Click to speak with company leaders and employees, and to gain exposure to tech working environments and protocols. “Being that Indianapolis is becoming a large tech hub, coding knowledge provides opportunities for students to be recruited into the market. It gives an understanding of what goes into different businesses and the amount of programming that is required,” Meier said. Smart Tech Launch was created to marry the technical skills of coding with the problem-solving approach of a liberal arts education – a goal that many students appreciate. Meier said she learned that businesses need interpreters, in addition to employees who can code. “While I may not want to be the one to code the products themselves, I could definitely see myself acting as a liaison between the developers and the market. I am a business major and so I benefitted the most from being able to see another avenue to use the education I’m getting at UIndy,” Meier said. “I would encourage anyone who is interested in coding – and has the opportunity to learn – to do it,” Walker-Owens added. The 2018 Smart Launch Tech summer program was provided free of charge to students and funded by ICI, Eleven Fifty Academy and the Council of Independent Colleges through a venture fund grant. Sustainability planning is now underway. To celebrate this milestone, the University of Indianapolis is hosting a free, online class during the fall semester. Students, faculty, staff, alumni and the broader community are invited to explore this classic detective novel. 1. Return to the (virtual) classroom to read and discuss a classic novel! The course brings together community members, UIndy alumni and current UIndy students in an online discussion moderated by UIndy Professor of English Jennifer Camden. 2. The course has a “book club” feel. The weekly reading averages 50 pages, and the course is “credit/no credit” so you can spend as much or as little time on the class as you would like. 4. 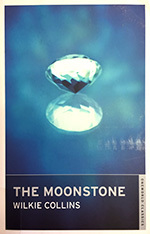 This year’s novel is a page-turner! A few teasers: a priceless, cursed diamond is stolen…twice! Indian Brahmins, in disguise as jugglers, haunt an English country estate, using hypnotism to divine the whereabouts of the diamond. A maidservant with a criminal past is behaving strangely…an opium addict with a mysterious past may be able to solve the mystery….Sergeant Cuff, aided by the steward, Betteredge, and the intrepid Franklin Blake are on the case! 5. If you’re near campus, you can join us for several in-person lectures. Taking place September – November, these discussions will present different disciplinary perspectives on the novel: Dr Chad Martin (UIndy-History); Dr Amy Allen Sekhar (independent scholar and disability rights activist); Dr Jonathan Evans (UIndy -Philosophy); Prof. Heather Williams (U Cincinnati-English). *Register by mid-August to guarantee your spot in the class, which will begin the week of August 27. Update, June 18: Construction continues with roadway and sidewalk improvements. Click here for more project details and a live construction map. Sign up to receive weekly updates by scrolling to the bottom of the page at www.IndyGoRed.com. 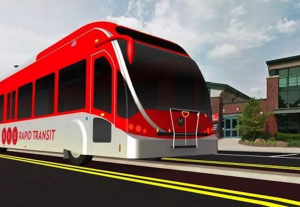 Indy Go announced that construction on the $96 million first phase of the Red Line bus project will begin Monday, June 4. Construction will begin with roadway and sidewalk improvements along Shelby Street — drivers will notice advance construction signage and some traffic pattern adjustments. No lane restrictions are anticipated, but some lane shifts will occur along Shelby Street at Campus Drive North, Southern Avenue, and Pleasant Run Parkway South Drive. Oh, the places they went! 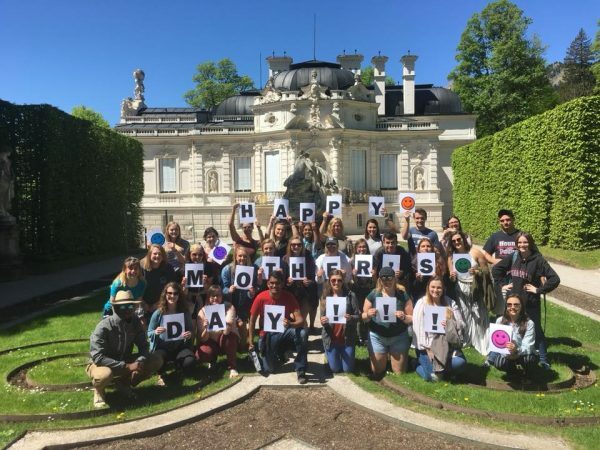 Greyhound students, faculty and staff went on a variety of service learning trips in May to destinations including Brazil, Haiti, Guatemala, Austria, Barcelona, Rome, Costa Rica, Scotland and more. 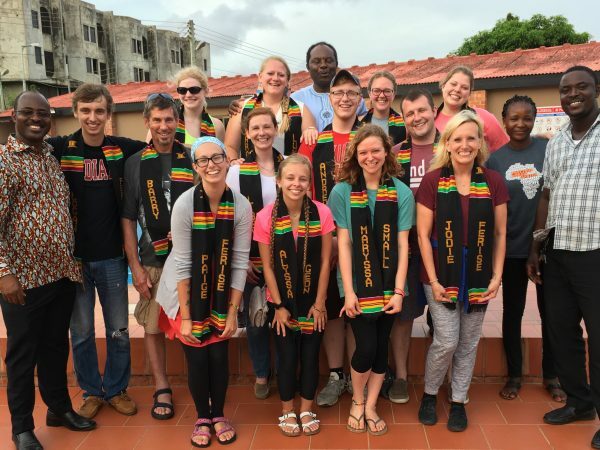 Led by University of Indianapolis Associate Provost Jodie Ferise and Assistant Director of Student Activities Steven Freck, the Precious Words Africa project made its seventh trip to Ghana in May 2018. 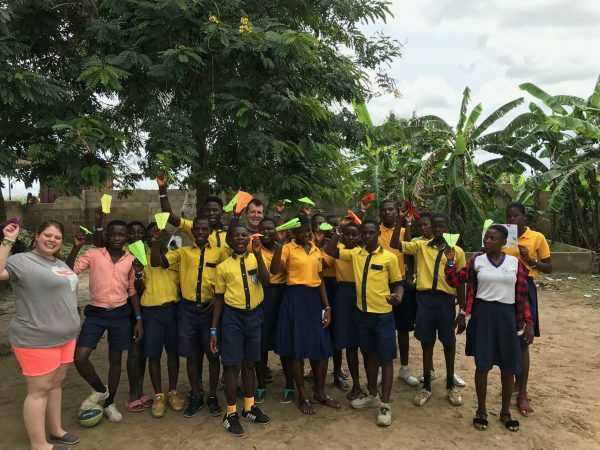 A group of 15 students and alumni spent 12 days in Ghana distributing materials and educating children eager to learn. The team completed four days of camp activities at three different schools and served over 500 kids! Activities ranged from making paper airplanes to learning about the differences between the Ghanian and United States flags. This picture is from Papaase, the third school they visited. The UIndy team fundraised over $8,000 to help refinish the pre-school and kindergarten areas of the Precious Kids Academy. They dedicated a day to painting & cleaning the classrooms so they could stock the shelves with brand new school supplies for the children. At the closing dinner, each person was presented a ceremonial kente cloth to celebrate the love and hard work they gave to the Ghanian people. Every participant hopes to travel back to visit new, dear friends across the Atlantic. 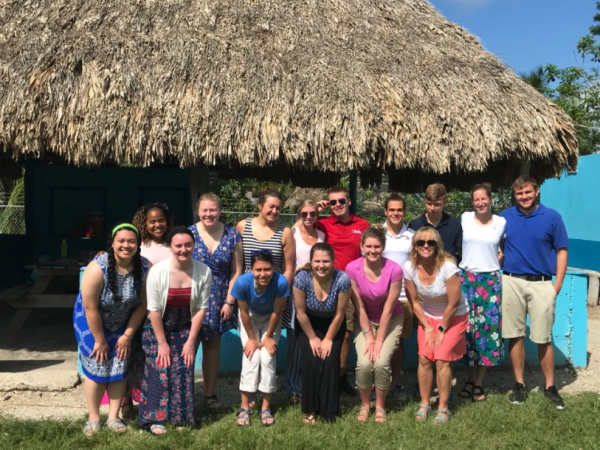 Thirteen students from the public health program traveled to Belize for some hands-on learning. 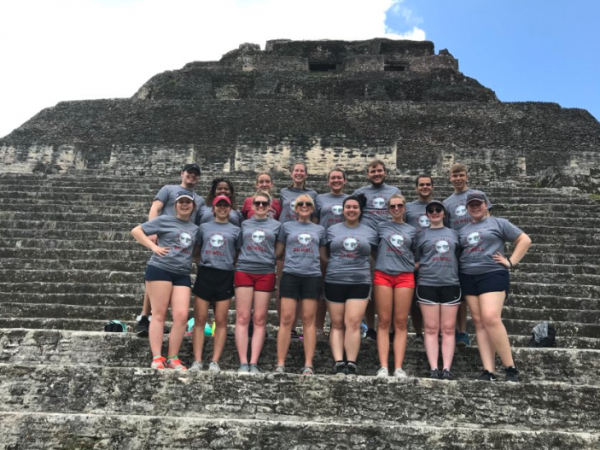 The group covered topics related to nutrition, hygiene and much more – plus they found time for a little sightseeing along the way. 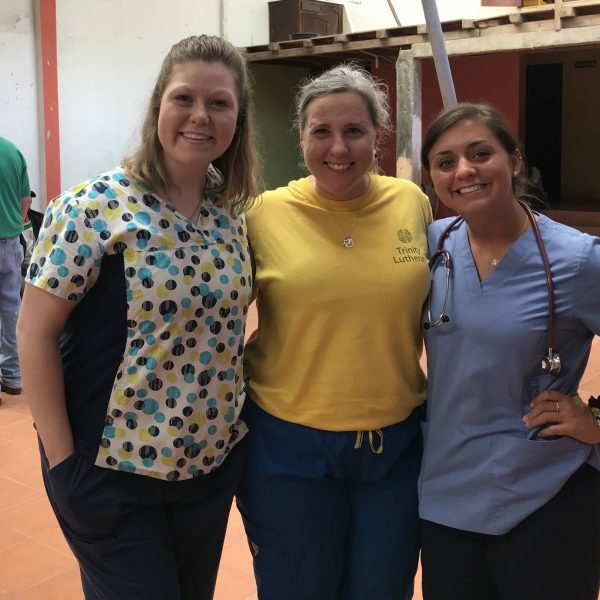 A team of eight students & two trip leaders flew to Ecuador for a healthcare service-learning experience. 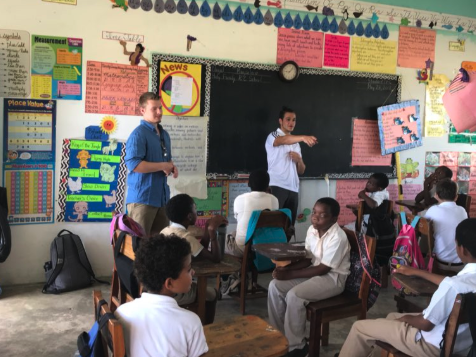 The group participated in two healthcare clinics, health education, and a community service project in the town of Yantzaza. 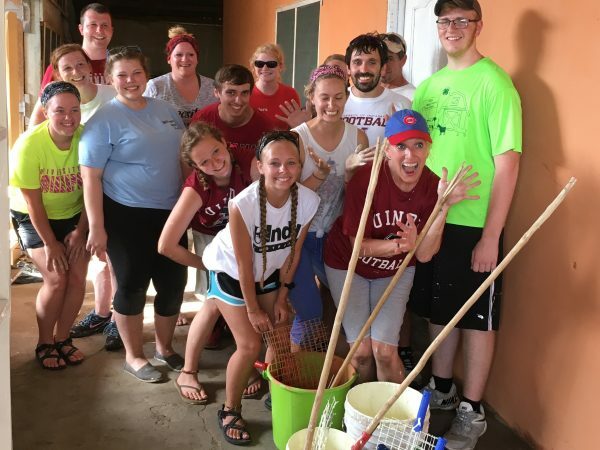 Students called it a life-changing trip & a true blessing. "We a great time and touched many hearts in Ecuador." 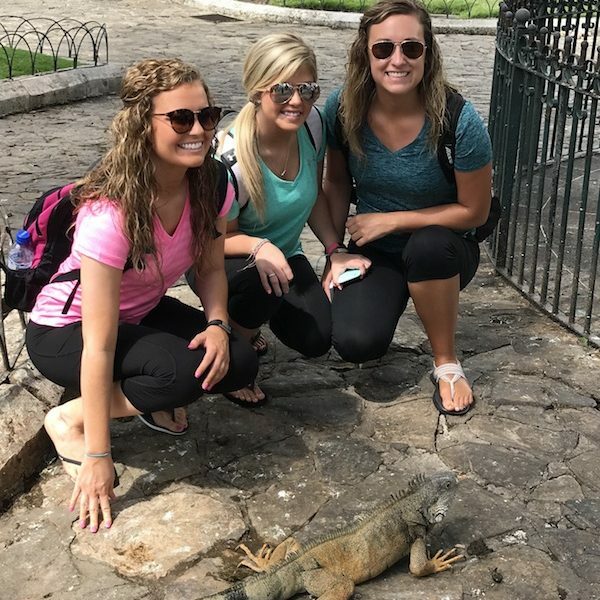 Cultural immersion activities included visiting an Ecuadorian zoo, shopping in an open market & visiting an iguana park. 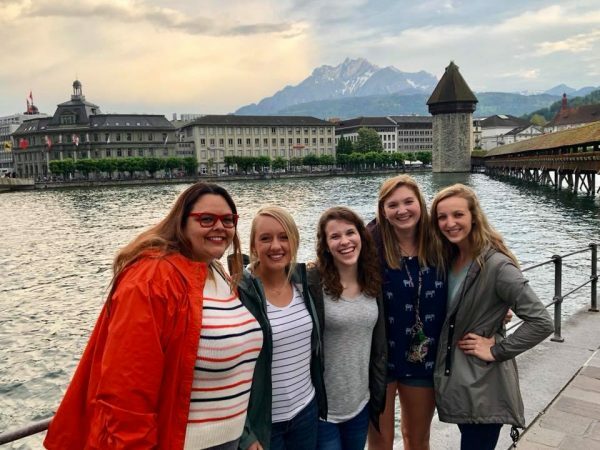 More than 30 Greyhounds trekked through Switzerland, Liechtenstein, Austria, and Germany for a 10-day study abroad adventure. A small group of student workers, known as the BizHounds Team, has helped the University of Indianapolis School of Business increase deposits by 20 percent in the last year, while the national enrollment average is decreasing. Associate finance professor Matt Will, who founded and leads the BizHounds Team, credits creative, peer-to-peer recruitment strategies for the program’s success. BizHounds officially launched in the winter of 2013 with two student workers. Within the first year, Will says, enrollment trends reversed and the School of Business saw a 10 percent increase, a pattern that has continued since. Four students – Emily Sands ‘18 (finance), Claire Gilbert ‘18 (marketing), Olivia Vormohr ‘20 (finance) and Jenna Whitmore ‘21 (business administration) – are staffed on the BizHounds team, where they focus on recruitment and engagement activities. Goals center around getting students to apply, convincing them to make deposits, converting deposits to on-campus attendance and engaging new freshman in activities to get involved. The group meets weekly with faculty advisors (Will and Andre Givens, Director of Undergraduate Enterprise and Engagement for the School of Business) to brainstorm new ideas and collaborate on existing projects. The BizHounds Team travels to events in the region and across the country to promote the University. In 2017, the group visited Orlando for their first national conference. In March 2018, they spoke locally at a Business Professionals of America (BPA) conference to an audience of about 300 and in May 2018, they traveled to Dallas for the 52nd Annual BPA National Leadership Conference to continue expanding recruitment efforts beyond the Midwest. 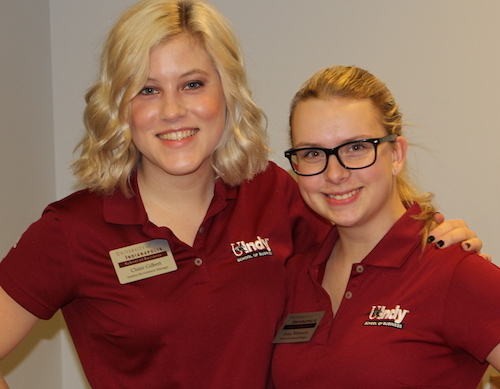 “We’ve learned that high schoolers respond best to stories, so we used our own experiences to cater to the needs of potential future UIndy students and to better connect with them,” Gilbert explained. As Will points out, these experiences have benefits beyond recruitment. Lauren Bryant ’18 (biology and psychology) will be among 33 women representing the 500 Festival Princess Program for 2018. Bryant is an Honors College student and Greenfield native who will attend Indiana University School of Medicine in fall 2018. “I am so thrilled and honored to be selected with 32 other amazing young women to help the 500 Festival accomplish their yearly mission – to celebrate the spirit and legacy of the Indianapolis 500 and to enrich lives,” Bryant said. The 500 Festival Princess Program, presented by Reis-Nichols, has a long history of celebrating Indiana’s most civic-minded, academically driven young women. Serving as a 500 Festival Princess provides participants with countless opportunities for leadership and professional development. Bryant said she’s eager to spread her passion for her hometown and state through service on a wider scale than ever before. “From teaching students the basics of physics with toy race cars, to volunteering at charity events with my 32 new sisters, to spending time reminiscing on the long history of the Indy 500 with nursing home residents, the 500 Festival Princess Program has connected me to Hoosiers from all walks of life,” Bryant added. 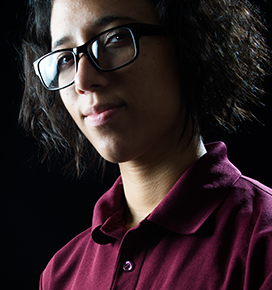 Bryant’s ultimate career goal is to start her own child and adolescent psychiatry practice. She enjoys working in the hospital environment and volunteers at Franciscan Health Indianapolis in her spare time. As part of the program, Bryant will receive a $1,000 scholarship, made possible by Marlyne Sexton, an Indianapolis philanthropist and president of The Sexton Companies, and the 500 Festival Foundation. Bryant is already noting the benefits of the 500 Festival Leadership Development Program, presented by BKD. “I’ve met professionals in all sectors who have taught the princesses skills in Leadership Development sessions and offered themselves as contacts for our future careers. Most of all, I am thankful to the program for introducing me to the other princesses, all of whom are generous, intelligent, vibrant women I now have the pleasure of calling my friends,” Bryant said. The 2018 500 Festival Princesses represent 14 Indiana colleges and universities and 21 cities and towns across the state. With a cumulative GPA of 3.72, this year’s 500 Festival princesses were selected from hundreds of applicants based on communication skills, academic performance and community involvement. The 2018 500 Festival Queen Scholar will be announced on May 19 during the 500 Festival Breakfast at the Brickyard, presented by Midwestern Engineers, Inc. The Queen Scholar will receive an additional $1,500 scholarship. You never know when saying ‘yes’ to a volunteer opportunity on a whim can help determine what you’ll do with the rest of your life. Erika Hoffmann ‘21 (elementary education, with concentrations in mild intervention and reading) started volunteering at Creekside Elementary School in 2016, when she was a senior at Franklin Community High School. At the time, she had no intention of becoming a teacher, but after a few months working with the kids, she discovered how much she enjoyed helping them learn and grow. When Hoffman transitioned to the University of Indianapolis, her previous volunteer experience and strong relationships at Creekside continued to pay off: she was invited by Sarah Records, a first grade teacher at Creekside, to come back and see how the beginning of the year works from a teacher’s standpoint. Hoffman is in the classroom with Records about three days each week, leading small group instructions, pulling kids for remedial help, aiding in testing sessions, and building relationships with the kids. Hoffman’s networking skills are also creating new opportunities for partnerships between the University’s School of Education and local schools. 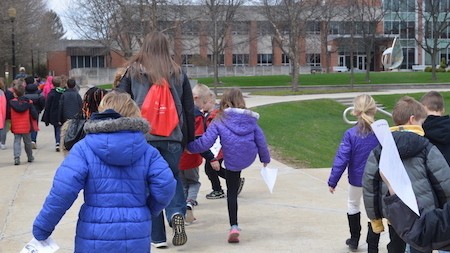 At Hoffman’s suggestion, Records brought a group of 105 first-graders to campus for a tour in April 2018. Kids from Records’ class leapt off the school bus and threw themselves into Hoffman’s arms, vying for her attention and shouting excitedly while she tried to instill order on the squirming mass of students. The kids were divided into three groups, each led by education students, including Hoffman. 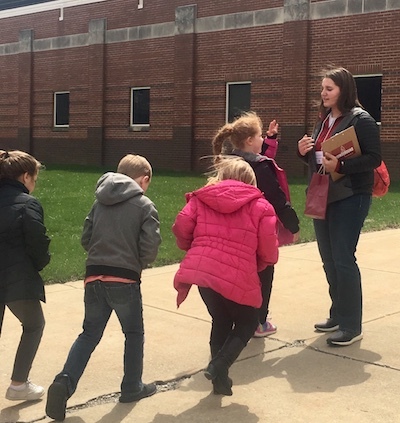 They visited the Krannert Memorial Library, the Schwitzer Student Center, and an elementary education class, where they participated in an activity with future educators and gave their opinions of what makes a good teacher. “Getting children acquainted with the idea of attending college gives them a goal and something to look forward to after high school. It gives them a ‘when I go to college’ not ‘if I go to college’ mentality,” Hoffman said. Records says she’s already started thinking about how to make the trip even better next year. She’s also excited to continue mentoring Hoffman toward a career as a teacher. Learn more about School of Education programs at the University of Indianapolis. 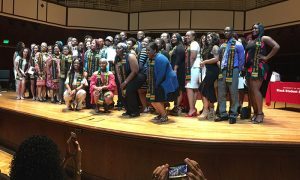 The cheers reverberated through Ruth Lilly Performance Hall even before students’ names were called at the Black Student Association’s 2018 Celebration of Success. The mood was jubilant at the second annual Celebration, one of several Senior Week events designed to highlight the achievements of outstanding graduates. “The Black Student Association’s Celebration of Success is an opportunity for the student organization to gather and rally around graduating African-American and African descent students to recognize their great accomplishment,” explained Jennifer Smith, Special Assistant to the President, Black Student Association advisor and Celebration organizer. Participation is open to all self-identified African and African-American University of Indianapolis undergraduate and graduate students who will earn their degrees in 2018. All participants received a Kente stole featuring a handwoven Ghanaian design to commemorate their graduation. After hearing from students and alumni who had expressed interest in creating the event over the years, Smith made it her mission to make the Celebration a reality. She solicited support from internal and external resources to hold the first BSA Celebration of Success in 2017, which honored 25 students. 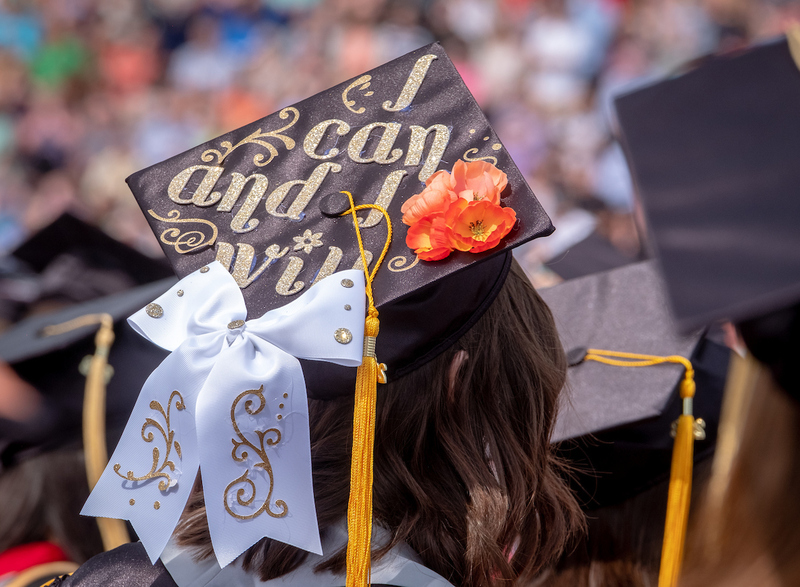 This year, the event recognized more than twice that number of students, including undergraduate, graduate and School of Adult Learning graduates. “Jennifer not only brought the idea [for the Celebration] to the University but saw it through to fruition. It is truly something that’s worthwhile and necessary,” said Sean Huddleston, vice president of the Office of Equity & Inclusion. BSA President Darin Sills ’19 served as master of ceremonies. Lauren Rascoe ‘14 (visual communication design and experience design) delivered the keynote address, and Jabree Bond-Flournoy ’18 (marketing) provided the Student of Success Inspirational Speech. A four-year student athlete on the men’s basketball team, Bond-Flournoy also served as public relations executive for the BSA, a representative for the School of Business Marketing Club and a member of the Alpha Phi Alpha fraternity. A student business leadership internship last summer with GEICO Insurance in Carmel, Ind. led to a job offer in the Management Development Program with the Sales Department. “I firmly believe it takes a village to raise a family. My village at the University of Indianapolis was shaped by some of the most inspirational people on this earth,” said Bond-Flournoy, noting the guidance of on-campus mentors such as Corey Wilson and Kirk Bryans in the Professional Edge Center and his basketball coaches, including head coach Stan Gouard. “You don’t know everything. Life has so much more to offer you and there’s so much more to discover. Take advantage of that!” she said. Learn more about the BSA and other student organizations at the University of Indianapolis.